Because if its location and the fact that it is one of Lake Michigan’s best natural harbors, a great deal of commercial and recreational boat traffic passes through here. Its population swells from about 3,000 people to 30,000 in the summer, as vacationers and summer residents come for the fishing, boating, and natural beauty. The Chesapeake and Ohio Railroad used to run through the area. Now that the track has been removed between Charlevoix and Petoskey, the resulting rail trails along Lake Michigan have made the area a mecca for bicyclists and cross country skiers. 23 miles of the trail are continuous and paved. The Little Traverse Wheelway once again offers trail lovers a great view of Little Traverse Bay from Charlevoix to Petoskey and on to Harbor Springs. The "Bike Path" is one of the country's top "Rails to Trails" successes. Those seeking a retirement community here have the opportunity to live on or near the water due to the ample coastline provided by 3 lakes and a river. 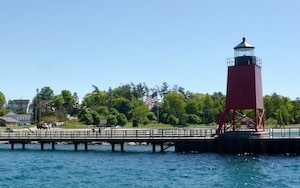 According to Zillow.com the median list price of a home in Charlevoix in early 2019 was $295,000. There are homes offered for far higher prices on the water or in the top neighborhoods. It's cold in the winter. It is a small town far from anywhere. Charlevoix is located on an isthmus in northwest Michigan where Lake Charlevoix's short Round Lake/Pine River complex flows into Lake Michigan. Charlevoix has a number of festivals throughout the year, such as the harvest festival. There are 4 newspapers in the area, as well as a triplex movie theatre. Crime is slightly below the U.S. average. Pellston Regional Airport of Emmet County is 38 miles. Many people get around town on a bike, and the bike path going to Petoskey and Harbor Springs is spectacular. 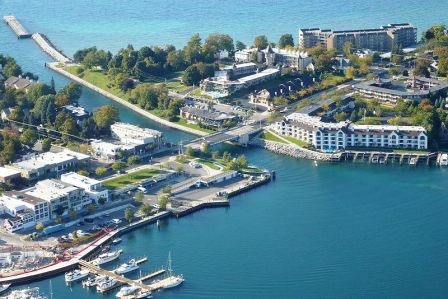 Charlevoix is a very walkable community.